What Kind of Shoes to Wear with a Maxi Dress? Do you plan to go out with your husband but can’t seem to find what to wear? Maybe you have an important business dinner and you want to look your best without looking too formal. Well, the Maxi Dress is your best option. An elegant dress perfect for any occasion, the Maxi Dress will fit many needs. Maxi Dresses come in all different shapes, sizes, and colors. With so many different options available out there, it can be hard choosing the right shoes to go with it. Luckily, we’re here to help! Both lightweight and stylish, Maxi Dresses are great for any occasion. Whether you are roaming on the beach and want to stay cool or going out for a night in the town, the Maxi Dress is a versatile choice for attire. Being an informal dress, there are both ankle and floor length Maxi Dresses. These dresses are beautiful and colorful. Choosing what kind of shoes to wear with them is a common challenge for many women. If you are wearing a longer length Maxi Dress, you really do not have to worry about that. But, for those who want to wear a shorter dress, you’ll likely want to make it known that you have cute shoes on. We’ve talked about long and short Maxi Dresses, but that’s not all there is. There are different types of Maxi Dresses and each has its pros and cons depending on your body type. These dresses have straps and are great for women who need extra support in their chest area. You do not want to be walking around in a dress showing too much for the guys. It also helps prevent sagging. The strapless Maxi Dress is perfect and hugs tight around the chest area. These are not worn nearly as much as Maxi Dresses with a strap, but they are still a viable option. If you feel like showing a little more skin, you should be wearing a strapless Maxi Dress. Depending on the occasion, you should consider wearing different shoes with your Maxi Dress. For instance, you do not want to be wearing heels on the beach in your Maxi Dress. The same goes for wearing heels when you know you will be standing for a while. A Maxi Dress is a loose and comfortable dress so a lot of women wear heels with it since everything else is comfortable. However, unless you are going out for dinner, you should stay away from heels with this dress (even though heels go great with it). Several different types of shoes will work with a Maxi Dress. We will go over a few that we think work best for you depending on your situation and style of dressing. Flats are a wonderful pick to wear with your Maxi Dress because they go with anything! Picking a pair of flats that match your maxi dress is a breeze. Whether you need a plain pair or something with more of a sparkle, flat shoes are a good option to go with. A classic pair of shoes, womens flip flops also look good with a Maxi Dress. A step up from flats, flip-flops offer a more versatile design to go with your dress. They are a great choice for any casual outing – nothing formal, though. For added posture and more emphasis, you can always go with wedges. Stand tall in your Maxi Dress with wedges. Creating a mixture of colors with wedges and your Maxi Dress is fun and stylish. Heading to a party and want to look your best? Heels are what you are looking for. Sync perfectly with your dress with a good pair of heels. Any pair of heels will do – from stilettos to chunky. If you are going to be on your feet for a while, prepare to have to take these off at some point! If you are looking for something more extravagant, espadrilles will do the job just nicely. They come in many different designs and work well with Maxi Dresses. Choosing espadrilles with heels is definitely the way to go here. This way, you get a fresh style without them looking too much like flip-flops. The balance between boots and a Maxi Dress is completely off. Boots are hot and not nearly as flexible as the Maxi Dress is. They simply do not match. Like boots, sneakers do not work well with a Maxi Dress. They are more sports oriented and contrast with what the Maxi Dress brings. Some women may find high heeled clogs to work for them, and that is okay. However, lower heeled clogs do not do the Maxi Dress any justice. Loafers are not as stylish as some of the shoes on our list. They are bland and a bit manly. This also contrasts the Maxi Dress’ elegance and is a mismatch. Let’s re-cap on the styles of shoes that really go down a treat with a maxi dress. We’ve already established that a maxi dress is a great look, especially for the summer, with its fluidity and generally lighter, airier fabrics that lend themselves well to balmy nights and warmer days spent by the pool. They are super versatile and can be dressed up or down to reflect your mood or location, easily taking you from the beach in the day (teamed with a pair of low sandals a or flip-flops and straw hat) to cocktails by the pool with a stunning pair of strappy heels and matching designer handbag. 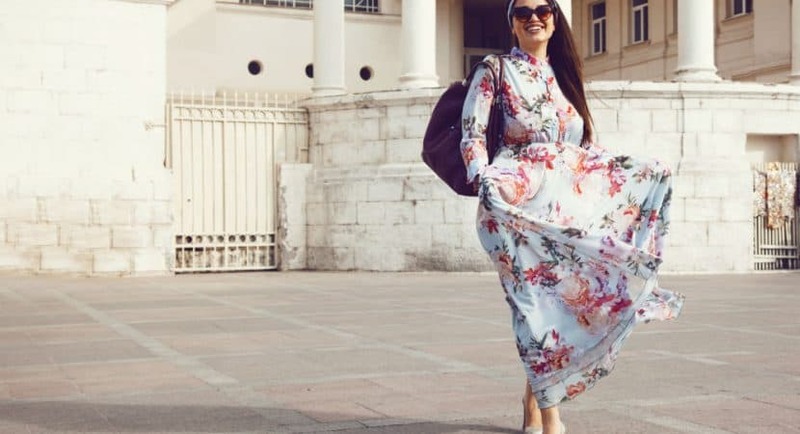 A maxi dress is all about giving you freedom of movement and expression so it stands to reason that you’re going to be able to match it with pretty much any type of shoe to compliment the look and style that you are trying to achieve. You can be bold and provocative even with your choice of shoe, as this is such a great look. Flats are the ultimate shoe to go with just about every outfit and look great with a long style maxi dress for both day and night. Don’t be afraid to experiment with sandals emblazoned with jewels or charms, feathers and elaborate ties, or even try out a pair of gladiator style flats with your maxi. You can keep it chic and casual or go for something more Boho and ethnic inspired with this look. Flip flops also fall into the flat category and there is nothing more refreshingly casual or versatile than a long maxi paired with flip flops for an effortlessly chic day out. Just make sure you have something more appropriate to switch onto your free later in case you head straight out for dinner. A wedge heel is a great shoe bridging the time between daytime casual and night time chic and if you are on the more petite size, will give you that extra height and poise when worn with a maxi. Don’t be concerned about mixing designs and fabrics. Wedges come in great textures and patterns, all of which look chic when worn together with a lovely bold eye-catching print maxi dress. If you are heading out to a party or poolside cocktails in your maxi dress, then you need to slip into something a little more glamorous. A heel can turn a good outfit into a fantastic one and with lots of style to choose from. You could opt for anything, from a stiletto to a pencil heel, a more demure kitten heel, or even a bold chunky heel. Match it with your best smile, some beautiful but simple jewelry, and a little purse and you are good to go. So you see, there really are lots of choices when it comes to what shoes to team with your gorgeous, free flowing maxi. From flats to flip flops and even a nice stylish espadrille, to the versatility of the wedge and stature and charisma of a killer heel, just don’t throw your sneakers on or a pair of clunky boots as they will just bring the whole light and breezy look down with their heavy-weight look. Maxi Dresses are a blessing. They mix elegance with comfort. They are perfect for many different occasions. They can be worn almost anywhere and they come in several different designs. This is both a good and a bad thing. With so many different options, choosing the right shoes to go with this dress might be overwhelming. However, with the recommendations from this article, you should now be able to more confidently pick a pair of shoes that will compliment this style of dress. You should think about where you are headed before choosing a pair of shoes on our list but other than that, you are free to wear any of the shoes we’ve discussed. From flip-flops to heels, choose the one that best fits your style and your dress. Stay away from contrasting shoes, though. This includes sneakers, loafers, boots, and low-heeled clogs.